Once again, I report that the kids are continuing the two series they've been reading for a while. C is still reading Magic Tree House books by Mary Pope Osborne and M is still reading the Elephant and Piggie books by Mo Willems. This week C read the first of the Merlin Missions, which is the set of Magic Tree House books that starts with number 29: Christmas in Camelot. This book is all about Jack and Annie keeping the magic of Camelot alive. Unlike the previous 28 books, this one is evidently more fantasy and folklore, and it's my understanding that all of the Merlin Missions books (29-45 so far) are similar. I'm very interested to see if C continues his obsession with this series as he tends to be a bit more apprehensive about fantasy stories. I do like that these Merlin Missions are longer and have harder words, according to C, but he said he didn't have a problem reading them. So that's good! We got this book from the library and have the next two on hold there. M has been reading three of the Elephant and Piggie books this week. I think the favorite this week has been Pigs Make Me Sneeze. 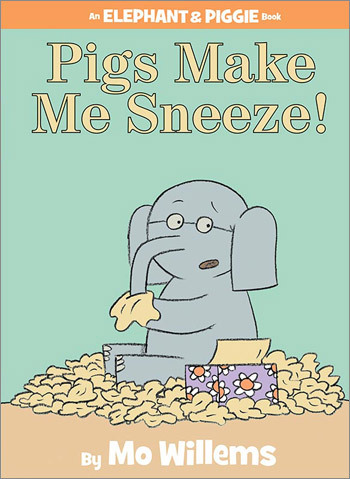 In this one Gerald gets a cold but he thinks he's sneezing because he's allergic to Piggie. Of course, this isn't the case, but it is quite funny as he worries so much about not being able to spend time with his friend. M loves these books as much as C did when he was at this reading level ~ and actually he still enjoys reading them now. Finally, I got a couple math related books from the library. C hasn't spent much time looking at the one I got him, but M seems to like the one I picked out for her. It's called I Can Count by Ray Gibson. 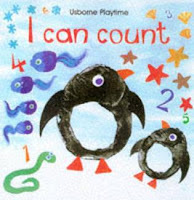 The book is a wonderful combination of counting and art. Each page has a certain number of items, starting with one and eventually going up to 50. The reader is encouraged to count the number of objects, but also to count the number with certain characteristics as well. Then on the other page, there is a six-step description of how to make the object using potato prints ~ although you really could just draw them. I love the combination of art and math in this book. Sadly Anna hated Merlin missions - too intense for her, so we are off MTH books for now. She does love Elephant and Piggie books which are admittedly more age appropriate :) Thanks for joining WMCIR! The counting book sounds great. I was looking for some counting books to begin the school year with.